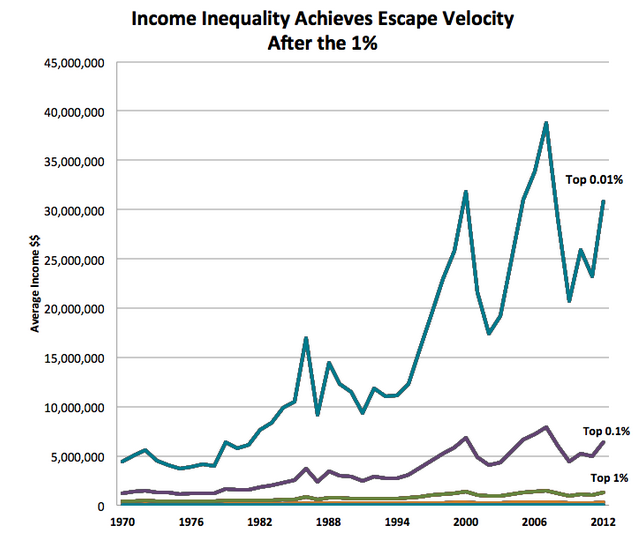 The richest 1% will have more wealth than the other 99% by 2016. Despite pure wealth, governance is the key to the notion of the 1%. The fact is that even the top 0.1% don’t have anything to say about governance, and neither do the top 0.01%, nor the top 0.001%. As it happens, if you are a billionaire, you are part of the 0.00003%; and those aren’t even the important billionaires, just your standard run-of-the-mill billionaires. Bill Gates (being the richest human) would have the unique distinction of being the only part of the 0.00000001%. This gives the term ‘society of entitlement’ a whole new meaning. This phrase is usually reserved for those who make so little money that they have to rely on government assistance. It might be a mis-nomer. It should probably refer to those who have so much money that they can tell the government what to do. Raising the minimum wage has been suggested as a means to close the wealth gap, and it has also been argued that the economics behind this argument is flawed. Perhaps then, it is time we start talking about a maximum wage. Final thought – If we were to get rid of 90% of the world’s population, nothing would change. If we, on the other hand, were to get rid of 0.01% of the world’s population, everything would. Which would be the more humane solution?